Art involving number themes can help the gifted explore their creative potential. Games are used extensively to introduce new concepts and reinforce lesson concepts. Math activities are designed to stimulate questions and promote problem solving skills. Based on their abilities, students may study up to four levels above their grade level. In preschool math the children are engaged in hands down hands-on fun! Math games are an exciting tool used to introduce new concepts as well as help students develop a more thorough understanding of the lessons. A class in a traditional preschool, just beginning to explore numbers, may be very dull to an artistically-gifted child who knows how to count and recognize numbers by sight. A Nysmith teacher understands the child’s talent and offers encouragement to undertake an art project involving the theme of numbers; for example, the child would make a portrait out of numbers. This allows bright, curious and creative children to explore their gifts and fulfill their potential. Math activities presented to the children are developed to stimulate questions and promote problem-solving skills in a fun and dynamic setting and are differentiated according to the needs of the individuals. The curriculum is magical, creative, sequential, and integrated. Art plays a VERY prominent role. Designed to foster a life-long love of reading. Phonics, phonemic awareness, vocabulary, fluency, writing and comprehension are key elements of the curriculum. More advanced readers may prepare book reports, solve analogies, perform plays, play vocabulary games, or incorporate more music, movement and art into their work. 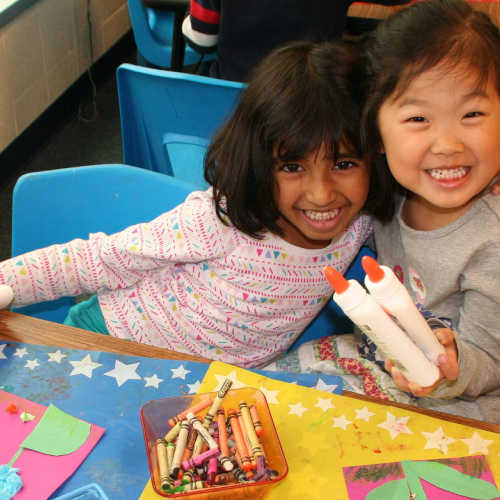 Our language arts program is designed to help foster in your child a lifelong love of reading. Each milestone is celebrated with enthusiasm, whether your child is associating a letter with the correct sound or reading their first chapter book. Beginner readers are introduced to a curriculum that is magical, creative, sequential and integrated. Phonics, phonemic awareness, vocabulary, fluency, writing and comprehension are integral parts of the curriculum. Advanced-level readers are presented with challenges to promote appropriate skills; activities may include preparation of book reports, solving analogies, performing plays, and playing vocabulary games, as well as using music, movement, and art. Very few schools offer science at this grade level – a true Nysmith advantage. At this grade, science is very closely tied to art. Students study the parts of cells. We cultivate an early appreciation for the scientific method! Students do lots of hands-on experiments. In preschool we incorporate science into the daily lessons. We tie together our projects with science, we tie together math projects with science, we tie together logic lessons with science. Includes an introduction to basic computer terminology and equipment. Emphasizes eye-hand coordination, clicking and dragging and double-clicking. Used to enhance math, reading, and logic skills. Explores a variety of software programs and applications. 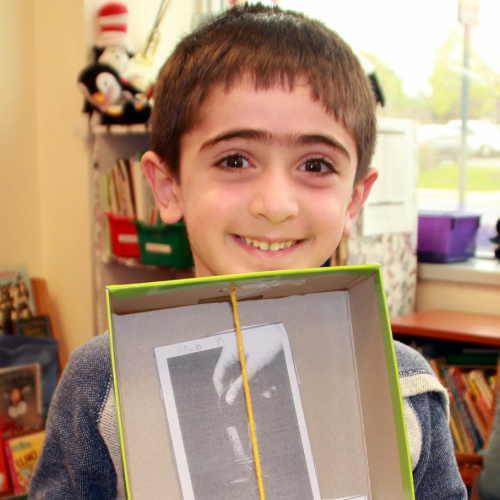 Students complete many special projects to reinforce classroom themes and activities. The preschool computer curriculum is designed to introduce your child to a fun and meaningful tool to present their ideas. Your child will be introduced to basic computer terminology: mouse, monitor/screen, keyboard, headphones, cursor, clicking and dragging. A variety of software programs are used to teach students the proper use of the mouse, with emphasis on hand-eye coordination, clicking and dragging, and double-clicking. Your child will come to the computer classroom daily for 30 minutes to enhance their math, reading, social studies, science, and logic skills. This is done as we teach your child skills to be successful on the computer. Your child will explore a variety of software applications and complete many special projects throughout the year to reinforce classroom themes and activities. Program is run in a semi-immersive environment. Instruction is suitable for children at all levels of comfort with a foreign language. A love of language and confidence in their ability to learn a language is the goal – not a specific degree of fluency. Students often work in small groups on hands-on projects to gain a deeper understanding of the language. Students are graded based on their motivation and effort toward learning the language. 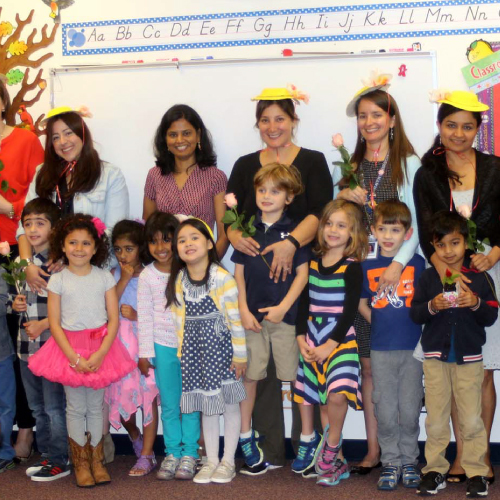 The goal of The Nysmith School foreign language program is to introduce your child to the joy of learning a foreign language in a fun, hands-on manner. We realize that children have many different abilities in foreign languages. Some Nysmith children are native speakers, some have an aptitude for foreign languages, and some children have difficulty hearing the nuances of a second language. We introduce your child to three languages in a semi-immersion process. Our goal is to help your child develop a love of languages, not necessarily fluency. With two teachers in each classroom, we are able to help your child be successful at the level that is right for them. Though our goal is to instill a love of language learning, our foreign language program is extremely strong. In seventh and eighth grade, our students take high school credit foreign language classes. Homework is minimal. Most high school foreign language classes require at least one hour of homework and evening to be successful but our program provides children with many of the same benefits at a fraction of the required homework time. Nysmith foreign language students work in small groups, with hands-on projects for a deeper understanding of the foreign language. Typically our eighth grade graduates join their high schools in their second year of foreign language. However, some high schools have placed Nysmith graduates in the third year of foreign language sequence. Your elementary child is graded based on their motivation and effort in the foreign language classes. Our goal is for your child to be confident they can learn another language and for them to want to learn other languages. The primary goal is to foster a love of music. Younger students are exposed to music from many different culture; we pair music with movement. Instruction is suitable for children with all levels of musical ability and experience. Starting at 3 years, your child will benefit from the Orff-Schulwerk music curriculum. At this level, your child will perform once a year on stage – and that performance will showcase their knowledge in a variety of subject matter areas, including French and PE. 30 minutes twice per week. Your child will sing a lot! In addition to singing and dancing while learning reading and math skills, your child will also have real music classes. Nysmith students from 3 years old through 6th grade have 30 minutes of music instruction twice a week. We realize that children have a variety of aptitudes and interests in music. We have students who have performed at Carnegie Hall and Strathmore as well as children who have not yet developed an interest in music. We have a variety of musical groups. Nysmith offers a string ensemble, jazz band, chorus, show choir and a flute choir. We also have limited individual instrument instruction tutoring after school. Nurture your child’s love of music. Build confidence performing on stage. Teach basic musical note recognition. Introduce your child to a love of performing music. The Nysmith School general music program is a performing arts program. Each grade has a major performance each year. 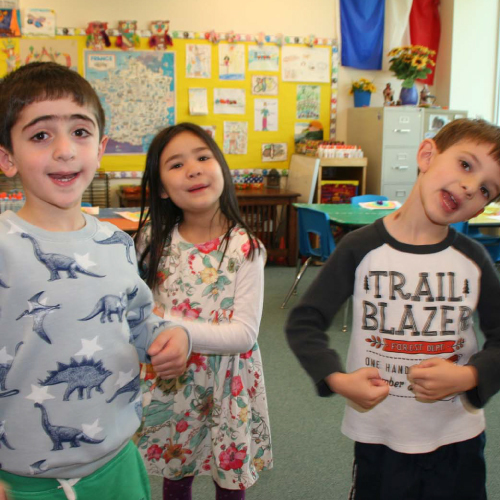 In the younger grades (ages three through kindergarten), your child will perform annually on stage demonstrating their knowledge in a variety of subject areas, such as social studies, music, French, science, PE and more. 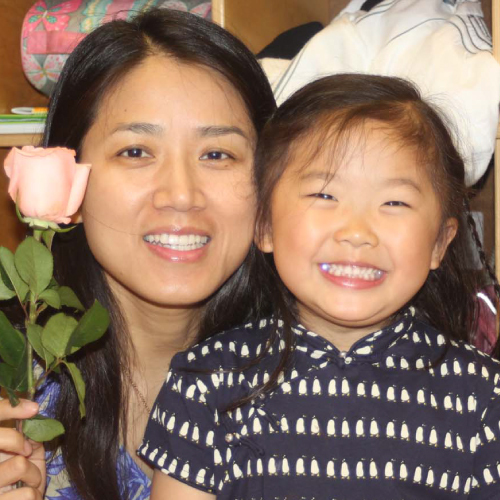 Beginning with first grade, your child’s performances are theme-based. Typical themes include famous Americans, which is tied together with social studies, and the Thanksgiving play, which includes both music and speaking parts. In third through fifth grades, your child will perform in grade-wide musical productions. Sixth-graders usually perform a Broadway Junior show. We love seeing students develop confidence and leadership through these experiences! The focus of this program is develop your children’s gross motor, balance, and coordination skills. All PE activities are intended to build cardiovascular conditioning, increase flexibility, and build strength. Nysmith students are introduced to the rules and skills of many sports without having to commit to them for an entire season. Preschool students have physical education classes approximately one hour each week which are taught by professional physical education teachers. The focus of the preschool physical education program is to develop your child’s gross motor, balance, and coordination skills as well as introduce your child to various sports. PE class begins with a quick fun activity that builds your child’s cardiovascular conditioning, a flexibility activity, and a strength building activity. Art helps history come alive for preschoolers! Art naturally complements the reading program. Students use art to depict the world around them. Disciplines such as foreign language and music make heavy use of art in this grade to teach basic principles. Nysmith teachers very skillfully integrate art principles into the teaching of the scientific method. Art is thoroughly integrated in the preschool curriculum. In preschool we believe that art can be incorporated into almost every aspect of your child’s education. Your child will do math using art, they will learn phonics skills using art, they will also illustrate scientific principles using art. Nysmith is a very project-based program, and art is a major component.